The conditions were perfect. With no moon in sight and a crystal-clear sky, the stars appeared to be exceptionally bright. And the water at La Jolla Shores off the coast of San Diego was flat-calm, like a lake. Not even the occasional ankle slapper. I have only seen the water like that off San Diego a few times in 40 years. After entering the water, Fred and I swam several hundred yards on the surface to get into position with our on-shore lineups before dropping in to explore a site known locally as The Canyon. Everything about the dive was perfect. Until we surfaced roughly 50 minutes later. On the surface we were enshrouded in extremely dense fog. Pea soup. I could barely see my hands in front of my face, and I am not exaggerating. There was not a breath of wind. Conditions had gone from calm to creepy. Every other time before or since this dive when I have surfaced at La Jolla Shores at night, at the very least I have been able to see lights on the shore and the lights in downtown La Jolla roughly a mile away. And there have always been waves rolling in from the Pacific toward the beach, so there was never any doubt regarding which way to swim to get to our exit point. That’s when Fred said, “Um, I don’t have a compass on me.” Fortunately, I did. We stayed close together while I navigated to shore, without incident. Later that night, as Fred and I sat in a local café talking about our dive, we contemplated the “what ifs”: What if I had not had a compass and known how to use it? Would we have made it safely to shore? Or, in zero visibility and no waves, would we have swam out to sea? Moray eels may look menacing, but they’re not out to harm anyone. Those who provoke them or try to handle them, however, risk being bitten. On a reasonably regular basis I share my photography and diving stories with classes and other diving audiences around the world. And often when I do, someone will compliment me by saying something like, “To get shots like those you must be a great diver.” I always appreciate the kind words, and I try to explain that being a great diver is different from being a good, or even great, photographer. During those exchanges I often remember that night dive with Fred. I also think about a few other dives, not ones that put me in any kind of dangerous situation, but ones that provided me with insight into the types of things that have made me a wiser, safer, better diver. Not the world’s greatest, and certainly not perfect. But better. Those are dives that have helped me realize how important it is to consider the “what ifs” and they help me keep the very real challenges and personal responsibilities of our sport in mind. Whenever the situation allows I try to turn a kind comment into a conversation with my audience, hoping these exchanges will help make audience members better divers as well. When it comes to “what I learned stories,” I could go on and on…. One of the dives I try to mention is one that helped me improve and gain confidence in my diving skills by forcing me to be the lead dive buddy. While we routinely talk about diving in buddy teams, in real life it is quite common that the responsibilities of the dive and for safety are not equally shared. All too often there is a lead buddy and a follower. Early on in my career I was all too willing to be the follower. I would tell myself that my buddy has more experience and that I will learn by watching. But instead of forcing myself to check his thinking and planning, I allowed myself to mentally “check out.” I didn’t bother to check anything. I just stayed on his or her hip throughout the dive so I did not get lost. One day one of my diving buddies told me it was my turn to lead. He candidly explained that he no longer wanted the pressure of making all the decisions, and never having his judgment questioned. I had not thought enough about things from his perspective. And it became abundantly clear that in behaving as I had been, I was unintentionally taking some of the fun out of my buddy’s diving and replacing that fun with unshared responsibility. So that day I planned the dive and served as the leader. The dive was made in a California kelp forest when the visibility was in the neighborhood of 25 feet (7.6 m). Not terrible by any means, but not exceptional. Anyone who has dived in a kelp forest in 25-foot visibility knows that it is relatively easy to become “directionally challenged” if you are not skilled in and confident about using your compass, as so many features look remarkably alike. Today I realize that those revised practices of shared responsibilities is a big reason I was able to be relaxed and competent some 10 years later on that night dive with Fred at La Jolla Shores. I realize I should not count on the other guy to equip, think or act for me. It’s my responsibility to be as self-reliant as possible. 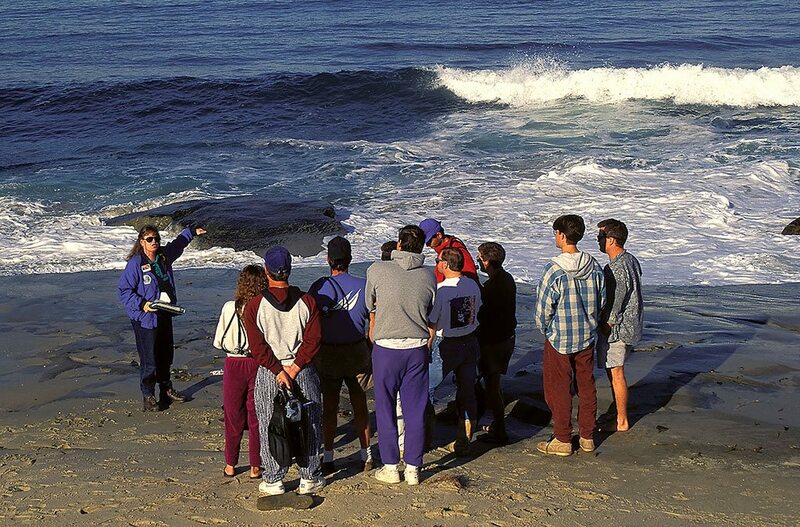 Always pay close attention during an area orientation or predive briefing. This is when important safety information is being dispensed — and you want to make sure you get a good dose of it. Years ago I was gearing up for a dive in the Galapagos Islands, a destination known for big animals and its occasionally strong surface currents, downcurrents and otherwise challenging conditions. I was in a group of six divers plus a divemaster, and at the suggestion/insistence of our dive leader, our group paid close attention to the dive briefing. The other two groups of divers on the boat talked among themselves, fiddled with gear, and really didn’t pay close attention to what was being said. During the dive, the mother ship broke free of its anchorage, and the vessel began to drift away. The captain could not start the engines because the ship was drifting in areas where our divers might be, and then into an area where another group of divers was in the water. The captain of our boat chose to use the diver recall. During the briefing, the divemaster explained the recall procedure, telling us that if we heard the recall sound, we should make a safety stop and head into the shallows where the dive skiffs would pick us up. And that is exactly what the divers in my group did. Several of the divers in the other two groups failed to recognize the diver recall signal. The recall signal and protocols had been covered in the dive briefing, but several people in the other groups had been in their own world. Perhaps they thought their dive buddies were doing the listening for them. The divers in the group I was in all made our way out of the channel and into the protected water in the shallows where we were picked up by the dive skiffs 30 minutes later. But that was not the case for several divers in the other groups. Not recognizing the diver recall signal, the divers in the other groups continued their dive and when they surfaced they were spread out. Some got swept around a point, drifting into the open sea. We spent the next two hours looking for and, thank goodness, finding all the divers. Everyone was safe and sound, so all’s well that ends well. But were people anxious? You bet. Scared? Yes. And cold and tired and a little seasick from bobbing around on the surface for so long. And all this could likely have been avoided if only they’d paid attention to the briefing and done as instructed. The takeaway message for me was that no matter how experienced I am, I should listen closely to dive briefings just like we were all taught to do in our certification classes. Doing so puts my mind at ease, and makes my dives more enjoyable. Few things are as helpful as local knowledge and knowing the protocols of a given dive. The cute little burrfish crushes shelled mollusks with its powerful jaws and strong teeth. It’s not a good idea to stick your fingers in its mouth. Here’s one more story about a dive that taught me a valuable lesson about wildlife. A male friend of mine was trying to impress his girlfriend by grabbing a burrfish. In the process of harassing the fish and glancing at his girlfriend, my friend got one of his fingers bitten by the fish. Seriously bitten. In fact, he lost a chunk of tissue along with his fingernail. 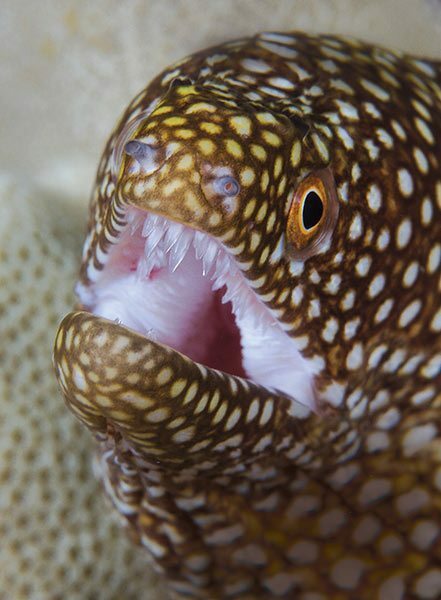 Not surprising when you consider that burrfish crush shelled mollusks with their powerful jaws and strong teeth. I think about that incident every time I see a diver try to grab, touch or handle a wild animal, whether that creature is a cute little burrfish, a moray eel, sea lion, or a big bad shark. Ultimately, no matter how much time we have spent on, around or in the ocean, we all need to think, plan, pay attention and respect the environment and the animals we share the water with. That’s just the way it goes when dealing with wild places and wild animals. In diving, just like it is in the rest of life, being self-reliant goes a long way toward making all of us into safer, wiser and better divers.